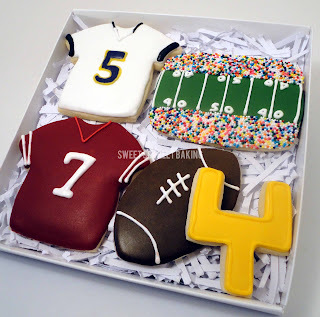 Sweet Scarlet Baking: Are You Ready for Some Football?! It's Super Bowl time! These two quarterback jerseys are ready to face off. My son's school is hosting a silent auction and I donated these football decorated sugar cookies to add to a Super Bowl Basket. I love this idea of using sprinkles for the crowd. when you are invited to view a game on any given Sunday.